Aaron is a talented baseball player, but this year his ability caused him problems. He couldn’t get onto the team he’s been playing on for the last five years because the coaches felt the teams would disproportionately matched. He was disappointed. I took him to his first practice on the new team. He didn’t know any of the other kids, but the coaches knew his name and seemed excited to have him. At home he moped and complained. This went on for a week or two. Holly and I were considering letting him sit out a year and then it all changed, almost overnight. I came home from work one night and found him in the living room practicing his wind up. He seemed excited. He told me that on his new team if he was on third base and the pitcher accidentally stepped off the rubber he could steal home. I asked if that was a new rule for this year (each year the league adds new elements to the game, like stealing bases or allowing the kids to pitch). He said it wasn’t. In fact, the kids have been able to steal home like this for a few years, but his old coach considered it poor sportsmanship and wouldn’t let the boys do it. But Aaron has no compunction with getting to home plate this way and apparently neither does the new coach. This is what I love about Aaron. He finds himself in a new situation and finds a way to make the best of it. I have been struggling to get my memoir moving forward. The last chapter I wrote was almost a year ago. Since then I have switched jobs, taken on sweeping life style changes, and even lost 30 lbs. I’ve poked around with submitting my work (and I feel good about that) and I’ve been toying with essays from different parts of my life, but I have to find a way to get to home plate with this manuscript. 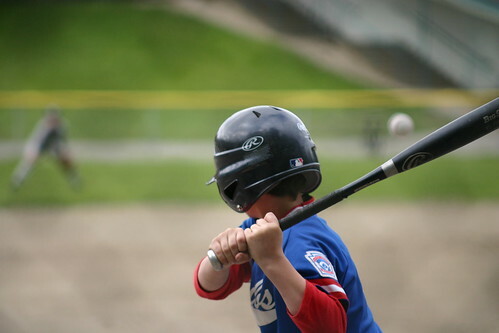 Oh, those Little League years. I miss them. As for the manuscript . . . you can’t steal home, you have to hit a home run. No more poking around. Swing that bat! Hard! Good luck.